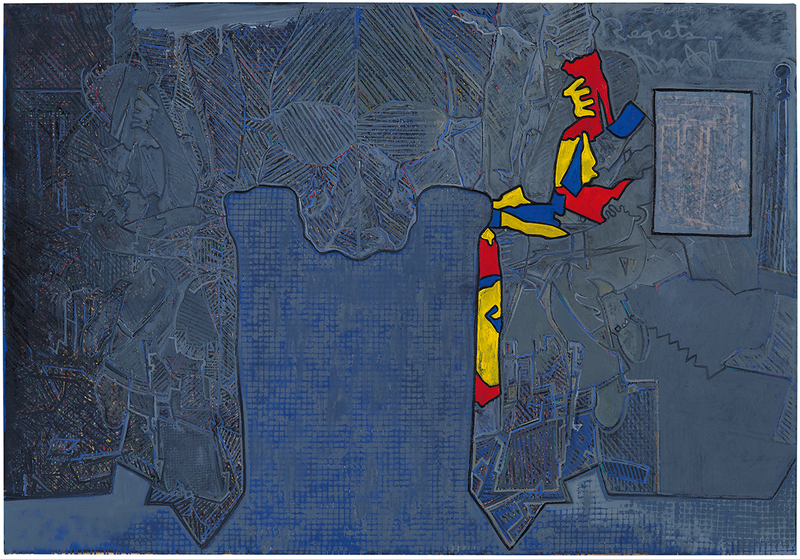 Jasper Johns: Something Resembling Truth at the Royal Academy of Arts, London. Although the Royal Academy’s celebration of Jasper Johns curates his work thematically, the opening galleries are weighted towards those distinctive early works. In the 1950s, his engagement with a vocabulary of symbols —the American flag, targets, maps, numbers, alphabets— became his aesthetic exploration of shared perceptions and a subversion of the standardised by personal and idiosyncratic expression. For this reason, printed reproductions of his work do not serve it well: they flatten the crucial physical presence Johns achieves with encaustic painting, a technique using heated wax that provides complex textures. When combined with a subtle use of collage, Johns rebuilds what familiarity has destroyed. Later in the exhibition, Johns’s alter ego is revealed as Harlequin, the trickster from the Commedia dell’Arte. For the most part, though, the otherwise informative exhibition text fails to register the sheer enjoyment infusing much of his work: he makes us think but simultaneously entertains. A good example is the colourful False Start (1959), loose, gestural, and with the names of colours in other colours, e.g. the word ‘orange’ painted in white. Enthusiasm and exuberance are also conveyed through work combining painting and objects. Painting with Two Balls (1960) is a canvas covered with abstract dabs of primary colours. About a third of the way from the top there is a split and two small balls are jammed into it. Through the split we can see the gallery wall, which is appropriated to become part of the artwork. The smaller Painting Bitten by a Man (1961) shows Johns adept at the visual quip. That Johns has serious intellectual interests is beyond doubt. His frequent inclusion of language, usually fragmentary and ambiguous, at times has references to particular writers: Tennyson, Melville, Hart Crane, Frank O’Hara. In 1973 he met Samuel Beckett and it resulted in the collaboration Foirades/Fizzles, an artist’s book published in 1976. Beckett and Johns selected and combined work concerned with fragmentation. The exhibition includes a copy of this book,, with framed pages displayed next to it. While Johns’s importance in mid 20th century art is secure, he can sometimes seem hermetic, especially when referencing his own past work. He is of course too sharp not to be aware of this and it is often done with self-deprecating humour. Even so, there is the suspicion that this is a way of getting his excuses in first and pre-empting criticism. If the Johns oeuvre includes occasional self-parody, it is a small price to pay for the bounty of challenges and amusements he gives us. Work needs genuine authority to command the Royal Academy galleries, and Jasper Johns does it with gleeful ease. Robert Richardson is a visual artist and writer. His work is included in Artists’ Postcards: A Compendium (edited by Jeremy Cooper, published by Reaktion Books, London). In 2014, his solo exhibition TextSpaces was exhibited at Eugen Gomringer’s Kunsthaus Rehau in Germany. One of his designs will be included in a book about Leeds Postcards, to be published in 2018 by Four Corners Books. He is a member of the Biennale Austria association of contemporary artists.